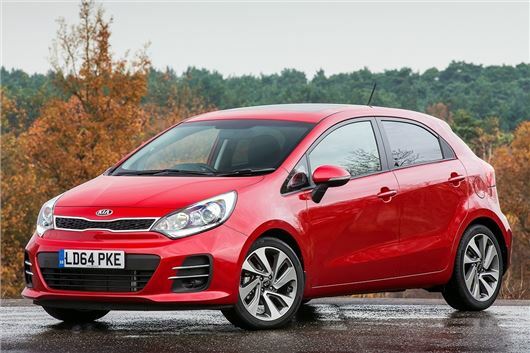 The revised Kia Rio is now available. The updated model gets styling tweaks, a revised interior and better standard equipment, though retains the same engine range. Prices start at £10,345. Externally the revised Rio isn’t massively different, but it has new bumpers front and rear to give it a sportier look, plus there is a new exterior colour, along with new alloy wheel designs. In the cabin the Rio gets some colour tweaks to the upholstery and centre console but more important is the improved standard equipment. Mid- and high-spec models get a new touchscreen system with navigation, plus electrically adjusted and folding door mirrors. All versions get DAB radio, hill start assist and tyre pressure monitoring. The engine range is the same as before. The most efficient option is the 75PS 1.1-litre CRDi diesel, which emits as little as 86g/km. There’s also a 90PS 1.4-litre CRDi diesel with official economy of 70.6mpg and emissions of 105g/km, plus a 1.25-litre petrol with 85PS and a 1.4-litre petrol with 109PS. This is offered with a torque converter automatic transmission. As before there are five trim levels – 1, 1 Air, 2, 3, 4 and 5. Entry level models get electric windows, Aux and USB connectivity and split/fold rear seats, while ‘1 Air’ adds air conditioning. ‘2’ models gain 16-inch alloy wheels, front fog lights, a cooled glove box and electrically heated and folding door mirrors. ‘3’ models get larger 17-inch alloy wheels, privacy glass, LED running lights, automatic air conditioning with auto de-fog, automatic wipers, automatic lights, cruise control, heated front seats and a six-speaker audio system. Top ‘4’ models gain keyless entry and start, an electric sunroof, heated steering wheel and leather upholstery.